If you follow my facebook page, you know that I was out of commission this week for good reason. Sock! Crunch! Pow! Ooff! No, I wasn't laying around watching re-runs of Batman. That was the sound of my body being attacked by the seasonal flu. After living on ginger ale, crackers, and chicken broth for days, I needed something to re-charge my system. This recipe came to the rescue. You may be wondering, "where does the green color come from?" Ready?! Spinach. Yes, spinach. But really, you can't taste it. It just adds a bounty of vitamins and nutrients, not to mention a beautiful bright green color that I find welcome this time of year. The flavor and creaminess comes from frozen banana and pineapple. Since my system is a little iffy with dairy right now, I chose to use vanilla flavored soy milk, but you can use regular milk, yogurt, or juice for that matter. Since the frozen fruit adds plenty of natural sugar, I don't add any, but I do like to bump up the nutrients (namely omega-3 and lignans), with the addition of ground flaxseed. It lends a nice, nutty note. Packed full of antioxidants, vitamins, fiber, iron, and potassium, this is one smoothie that will take your body from drab to fab in no time. It is quick, easy, gluten-free, dairy-free, and vegan friendly. 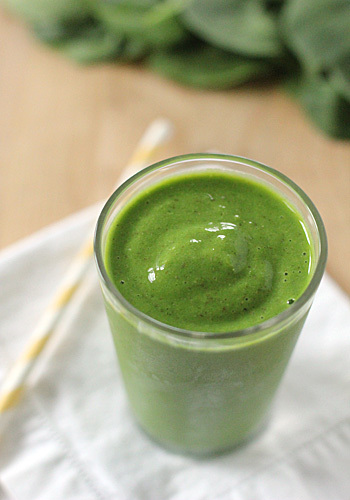 I call this "Tropical Green Smoothie I" because there are other tropical variations of this green smoothie in my repertoire to share, but for now-- Kapow! Whack! Sock! Bam! That was me punching back at the flu bug with a lot of help from this sweet and creamy beverage. *Note- after enjoying a batch of these for breakfast this morning, my first grader said that I should serve these on St. Patrick's Day morning because they are green ☺. Kid tested mother approved! 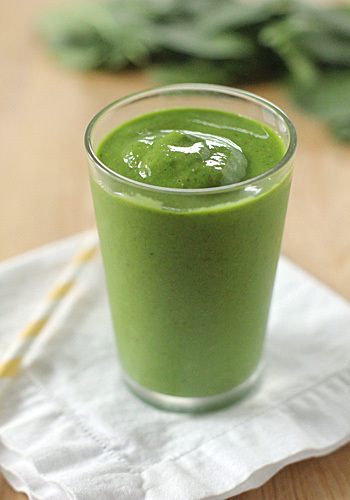 In a blender, blend the soy milk, flaxseed, and spinach until smooth. Add the frozen fruit and blend until thick and creamy. Pour into serving glasses. Enjoy! I think I am going to make it now, banana and pineapple, oh yes, those two can do a miracle! So delicious and full of goodness - I suppose you could use almond milk instead of soy? Yes, almond milk can be used in lieu of the soy milk. You can also use regular milk, and/or fruit juice, like orange or apple. Making these for brunch tomorrow! I’ll let you know how my family likes them – big smoothie people here!